PRESTO card users travelling on GO Transit between Union Station and stations near Toronto, such as Port Credit, Malton, Pickering, Ajax or Markham will see fare reductions. Premier Wynne was joined by Kathryn McGarry, Minister of Transportation, at Willowbrook Yard in Toronto in April 5, to explain how Ontario's 2018 Budget is making life more affordable for families across the Greater Toronto and Hamilton Area (GTHA) through these significant changes to transit fares. Making travel on the GO network more affordable and improving fare integration by lowering the cost of transferring between transit systems will make travel easier in and around the GTHA for the tens of thousands of people who use transit every day. Reduced fares will also ease congestion on subways and buses by offering transit users more options for travel. Reducing and integrating transit fares is part of the government's plan to support care, create opportunity and make life more affordable during this period of rapid economic change. The plan includes free prescription drugs for everyone under 25, and 65 or over, through the biggest expansion of medicare in a generation, free tuition for hundreds of thousands of students, a higher minimum wage and better working conditions, and easier access to affordable child care. Adult fares for GO Transit trips between approximately 10 km and 20 km will also be reduced, and will vary between $3 to $6, depending on the specific route. The reduced fare will apply to travel on the UP Express between Union, Bloor and Weston stations. It will not apply to Pearson Airport trips. Ontario has already cut the cost of commuting by $1.50 per trip for PRESTO users transferring between the TTC and GO Transit or the UP Express. Through Budget 2018, Ontario is committed to working with the TTC, York Region Transit, Mississauga’s MiWay, Brampton Transit and Durham Region Transit to introduce discounts to users who transfer between these municipal transit networks and the TTC, potentially saving cross-boundary commuters up to $1.50 per trip. 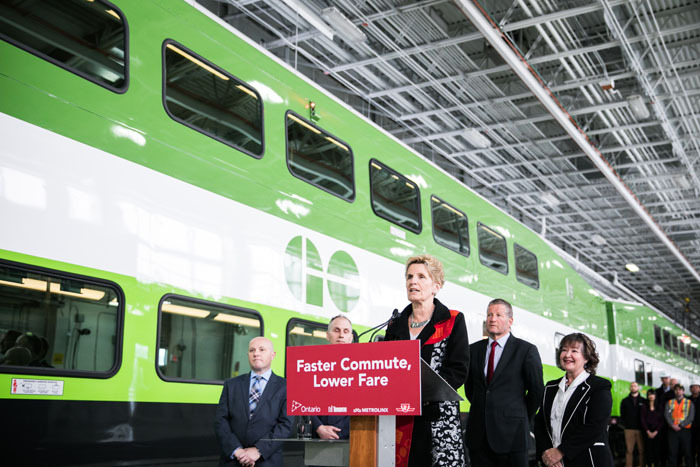 Ontario is investing $21.3 billion to transform GO Transit from a commuter transit service to a regional rapid transit system. The government’s Climate Change Action Plan puts a cap on pollution and reinvests all the proceeds in programs that make fighting climate change more affordable for people, such as lowering transit fares. On December 17, 2017 the Line 1 Extension/Toronto-York Spadina Subway Extension (TYSSE) opened. The TYSSE is the largest expansion of Toronto’s subway system in nearly 40 years, and will add an estimated 36 million transit trips, as well as eliminate 30 million car trips per year, helping to ease traffic congestion, improve air quality and fight climate change.